The player customizing a car at Los Santos Customs. Los Santos Customs is an automobile customization shop in Grand Theft Auto V that allows the player to customize various standard road vehicles in the game. Upgrades can be both aesthetic or mechanical. The garage is based on West Coast Customs. Los Santos Customs replaces the Pay 'n' Spray garages from previous games. The Los Santos Customs at Los Santos International Airport. 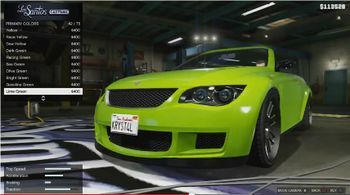 Los Santos Customs garages are located throughout the game. There are four within the game, located at Los Santos International Airport, La Mesa, Burton, and the Grand Senora Desert (the latter of which Franklin can purchase, and once he does, all modifications performed there are free for him). All motorcycles and the majority of cars and vans are supported, with the exception of some large industrial vehicles and emergency vehicles. All modifiable vehicles can receive performance upgrades and some cosmetic modifications (resprays, window tints, custom rims, novelty horns, license plates, and xenon lights), while some vehicles can have custom bodywork as well. This page was last modified on 6 July 2015, at 21:54.